I hate when hair on legs, hands and upper lips starts growing after 10 days of waxing or threading. It is really not possible to rush to parlor after every few days. No worries now Barever has come to your rescue. It is natural hair inhibitor that slows down the growth of hair. 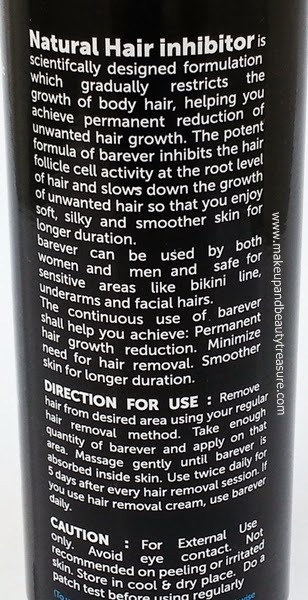 Barever is founded by the founder of Everteen (Review), the best natural intimate wash. Today I am going to review Barever Natural Hair Inhibitor. 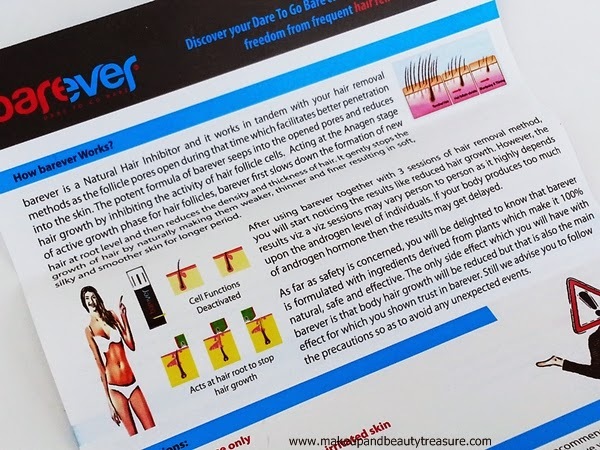 Barever Natural Hair Inhibitor comes in a black cardboard box packaging with a small leaflet. The actual product comes in a sturdy black bottle with a clear pull off lid. There is a pump dispenser that dispenses the right amount of cream. I love the color combination of logo on the bottle. The packaging is really elegant and stands out on my vanity table. It is quite light weight and can be easily carried around in a bag without any fear of leakage or spillage. The cream is off white in color with a mild smell. 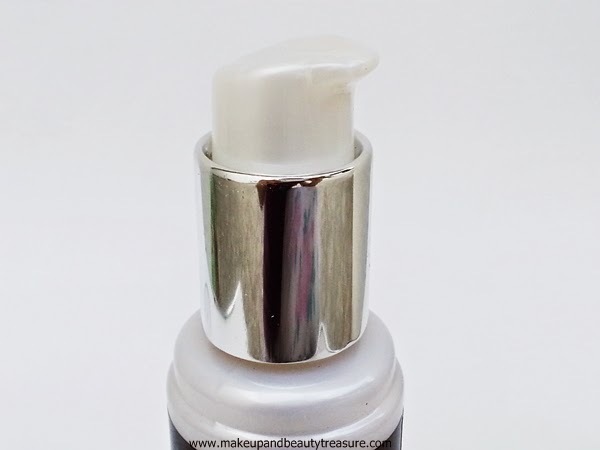 The texture of the lotion is soft and smooth with creamy consistency. It spreads easily and gets absorbed quickly. It has to be applied right after doing all hair removal techniques like waxing, plucking, threading etc. It has been advised to apply the lotion twice a day for 5 days on clean, dry skin. I tested the product on my hands and upper lips. I massaged it onto my hands and upper lips (You can use it on any other part where you want hair growth to slow down!) until it gets fully absorbed. It feels quite light on the skin and does not leave greasy residue behind. My skin feels soft, smooth and hydrated for a longer period of time. I don’t feel the need to use other moisturizer to nourish my skin. If you are using hair removing cream then the cream has to be used daily. Now comes the hair minimizing action part! It delays the time of hair re-growth. 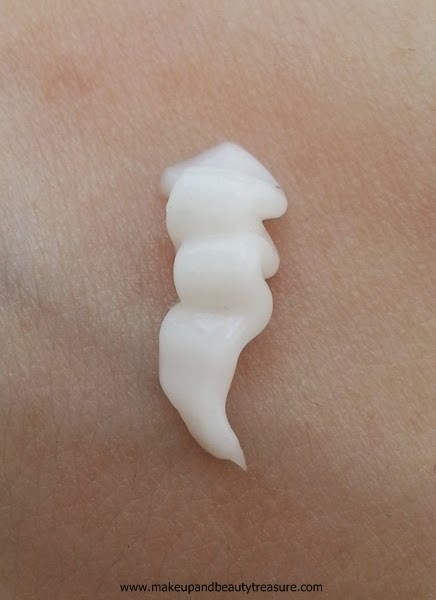 I usually get the hair re-growth after 10 days but while using this cream, I could see the hair re-growth extended and small hair started appearing after 20-25 days. I had also noticed that the hair that started growing after using Barever seems to be soft unlike spiky or hard hair. The hair looks quite thinner than normal when it starts growing back. I have not faced any adverse reaction whilst using this cream. 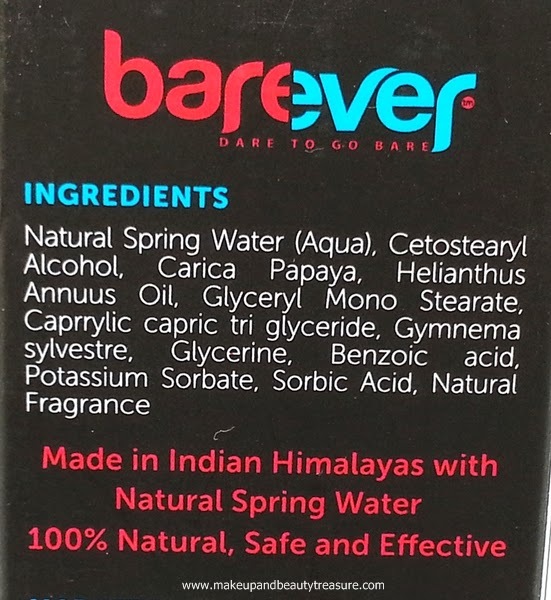 Barever Natural Hair Inhibitor can be used by both men and women and is safe to use on sensitive parts like bikini area, underarms and facial hairs. It is 100% natural and is made using natural spring water. • Slows down hair re-growth. Barever Natural Hair Inhibitor is the best natural hair minimizing cream I have tried. It not only marginally slows the hair re-growth but makes them soft and thinner. It makes skin soft, smooth and moisturized without leaving a greasy residue behind. It can be used even on sensitive skin as it is 100% natural and safe. I would HIGHLY recommend to everyone! Have you tried Barever Natural Hair Inhibitor? How was your experience? Share in the comments section below!